VW drops Jetta in Europe as it focuses sedan on U.S. The Jetta gets a bolder look, a lower roofline and more accentuated styling lines. It is longer, wider and taller than the outgoing version, adding interior space. DETROIT -- Volkswagen brand is dropping its Jetta sedan from European markets as it looks to the latest generation of the sedan to revive its U.S. sales. The Jetta is VW's top seller in the U.S. but in Europe, where customers prefer hatchbacks over sedans, it is one of the brand's lowest-selling models. VW said the seventh-generation Jetta was designed to meet the needs of customers in overseas markets. "There are no plans for a European version," it said in a statement on Monday. 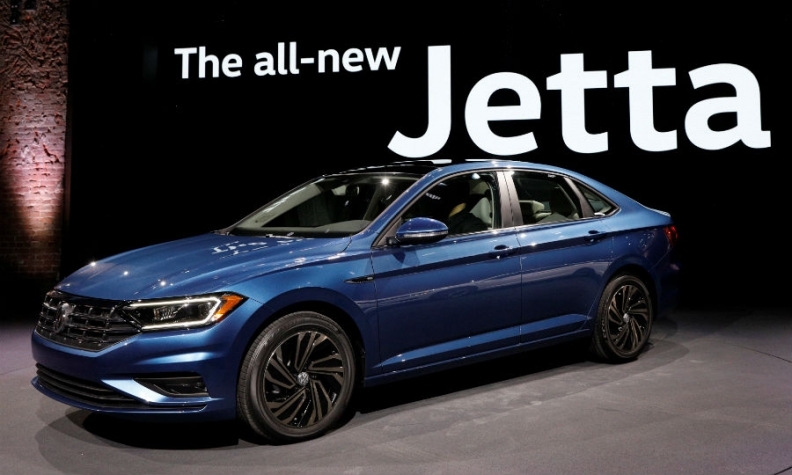 VW unveiled the new Jetta at the Detroit auto show on Sunday. The redesigned Jetta is larger than the outgoing version with improved driving dynamics, updated safety and infotainment technology. It is more fuel-efficient compared with the outgoing model. The Jetta moves to the automaker's global MQB platform that also underpins VW models such as the Golf hatchback. The sedan will continue to be powered by a 150-hp 1.4-liter turbocharged engine, but will now be mated to either an eight-speed automatic or six-speed manual transmission, increasing fuel efficiency. Models with automatic transmissions will come standard with a start-stop system to improve fuel economy. LED lighting will be standard. Inside the cabin, the Jetta will have a cockpit similar to that of the Euro-spec redesigned Golf, including Volkswagen's optional Car-Net infotainment system, compatible with Apple CarPlay, Android Auto and MirrorLink smartphone integration apps. The Jetta's top two trim levels, SEL and SEL Premium, will come standard with the automaker's Digital Cockpit display, allowing for a reconfigurable display of data, including navigation, on the instrument cluster. Also optional will be heated and ventilated seats, dual-zone climate controls and 10-color customizable wraparound ambient lighting. At five-liters in volume, the redesigned center console will be large enough to hold a standard-sized iPad. On the safety front, the Jetta will have a standard rearview camera, as well as a suite of available collision avoidance and other safety-related systems. They include autonomous emergency braking; blind-spot monitoring with an added function that alerts the driver to a vehicle approaching the Jetta's blind spot; adaptive cruise control, improved for use in stop-and-go traffic; lane-departure warning; and automated high-beam control. VW says it will introduce an R-Line trim level closer to launch that will have sportier styling, exclusive interior and exterior design elements, special badging and an improved electronic differential. VW sold 115,807 Jettas in the U.S. last year, down 4.4 percent from the previous year, including a 45 percent decline in December volume. In Europe, Jetta sales fell 25 percent to 5,368 in the first 10 months of 2017, according to data from market researchers JATO Dynamics. The new Jetta will launch in Mexico in the first quarter and in the U.S. market in the second quarter, VW said. It will continue to be built in Mexico. U.S. pricing for the new Jetta will start at $19,395 including delivery. The starting price is $100 less than the outgoing model. The Jetta was first introduced in Europe as a car based on the Golf with a large trunk. During its history, it was also sold as the Vento and Bora. The Jetta's U.S. version and the Sagitar Chinese variant were more successful than the European versions. The sixth-generation Jetta introduced in 2010 was the first time the Jetta received a design separate from the Golf. A sibling model of the new Jetta will be offered later in China under the name Sagitar, VW said.